Photo: Members of Border Guard Bangladesh (BGB) seize Indian Imitation Jewelry from Amrakhali, Benapole on Monday, April 15, 2019. 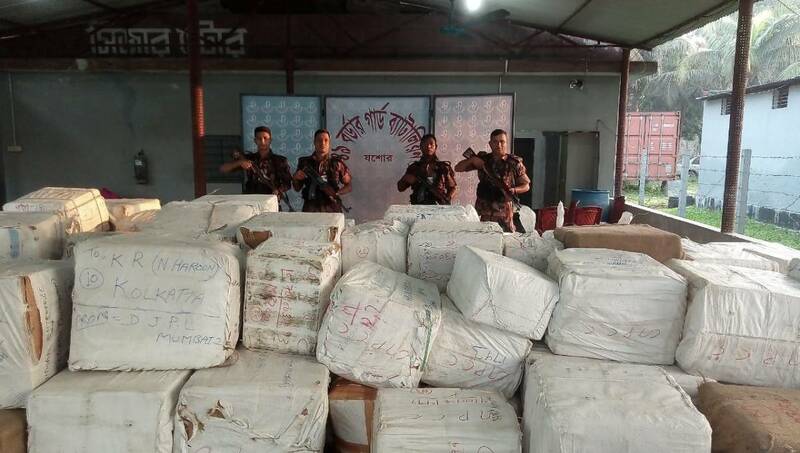 Benapole, Apr 16 : Members of Border Guard Bangladesh (BGB) seized three trucks of Indian Imitation Jewelry worth Tk 1.76 crore from Amrakhali area here on Monday night. Being tipped off that a consignment of imitation jewelry was being smuggled from India the BGB team conducted the drive and seized the trucks with the contraband item, said LT Col Salim Reza, commanding officer of BGB-49 battalion. Sensing their presence, the smugglers fled the scene leaving behind the goods. The seized goods were deposited to Benapole Custom godown.